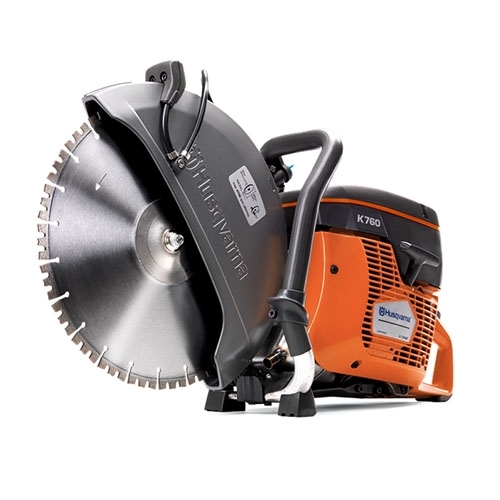 The Husqvarna K 760 is a powerful all-round disc cutter with features that make it one of the best disc cutters on the market. Equipped with the new generation Active Air Filtration™, one of the market’s most efficient centrifugal air cleaning systems that delivers up to one year’s operation without a filter change and SmartCarb™, a built-in automatic filter compensation and a highly efficient vibration dampening system. The K 760 is outfitted with an X-Torq® engine that reduces emissions up to 75% and lowers fuel consumption by 20%. Other important features include DuraStarter™, a dust-sealed starter that boosts reliability and product life, Air Purge and a decompression valve with makes the disc cutter easy to start. The K 760 is ideal for cutting concrete and stone in alterations, renovations and new construction. It is also perfect for cutting smaller holes and adjusting window and door openings, as well as some pipe, asphalt and metal cutting.